It is with immense sadness that we mark the passing of HARVEY LOWE on March 11th/09 - he was not only King of the Yo-Yo's, but most of all loving husband, father, grandfather, brother and friend. Born in Victoria, B.C. in 1918, Harvey lit up our world through nine decades and across three continents. He kick-started his childhood by winning the World Yo-Yo Championship held in England at the age of 13 and from there created a tremendous journey of a life - a journey which included World War II and being a radio broadcasting pioneer for CJOR (Call of China), a well known Vancouver Chinatown fixture and an "East-West" cultural bridge among many other accomplishments. Through brain tumours and by-passes, Harvey always turned back to his yo-yo's to heal him and remind us of the resilience, determination and joy that was characteristic of his life. Harvey Lowe is no run-of-the-mill yo-yo player. In September 1932, Lowe won the World Yo-Yo Championship in London. To this day, no-one has ever been able to wrestle it away from him. But yo-yos are only part of the Harvey Lowe story. 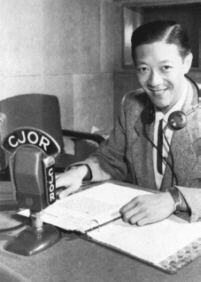 He's a Chinatown legend who had Canada's first Chinese radio show, a nightclub fixture from the '50s and '60s at clubs like the Marco Polo and the Smilin' Buddha, and a restaurateur who was involved with Chinatown hot-spots like the Bamboo Terrace, the Kingsland and the Asia Gardens. He was also the doorman at one of Chinatown's fabled gambling dens, taught Julie Christie how to smoke opium and was once a regular on the Smothers Brothers TV show. His story could have been scripted by Hollywood, except few would have believed it. Lowe was born in Victoria on Oct. 30, 1918, the 10th child of Lowe Gee Quai and Ming Yook. His father was one of three brothers who set up tailor shops on Government Street in the 1890s. Through a bizarre immigration mix- up, all three were given the same English first name, Charlie, but were given different last names: Lowe, Hope and Wu. A promoter named Irving Cook offered to take him to London, England, to promote yo-yos to a new market. With a tutor along to help him keep up his studies, the 13 year- old Lowe took the train across Canada, winning yo-yo championships along the way, and then sailed to England. His mother received $25 per month -- a fair amount during the Depression -- and Cook took care of all of Lowe's expenses. He won the World Yo-Yo Championship on Sept. 12, 1932 at the Empire Theatre in London, winning a prize of about $4,600 Cdn He remained in Europe until 1934. It was an amazing time. He visited the Eiffel Tower so often the guards would let "the little China boy" in for free. His manager insured his hands with Lloyds of London (as a gimmick: his hands were only insured for a day), and he taught the Prince of Wales (later King Edward VIII) yo-yo tricks. He kibitzed with stars like Fats Waller and Laurel and Hardy, drove around England in a car supplied by the Morris Company, and lived the high life. "I lived in the Savoy Hotel in London on the Strand. Oh, I was wearing a white tie and tails. After the war, he bought a typewriter and started writing stories about China, which he showed to Jack Short at CJOR. He wound up doing a half- hour show, Call of China. In the early 1950s he opened the Smilin' Buddha Cabaret on Hastings, and in the 1960s he was stage manager at the Marco Polo, one of Vancouver'scoolest nightclubs. "I helped the owners bring in the Platters," he recalls. "The Fifth Dimension, I paid them $1,000 for the whole week and there were five of them.